Kids will find these instructions enlightening, but so will many adults who have lived their whole lives in a warm climate but now find themselves in a cold one and have a hankering to build a snowman -- for the first time in their lives. Or maybe you are just young at heart and are open to learning a better and easier way to bring Frosty to life on your winter landscape. Regardless of your age, I owe you nothing less than a "thinking person's guide" that will show you how to make a classic figure that will both look great and endure (until warm weather arrives, of course). This project is great fun, and one of the wonderful things about it is that, if you are less than fully satisfied with the results, it is easy enough simply to move over to another area of the lawn and "harvest" the snow there to make a new beginning. From the proper way to make a snowman's "legs" to composing a classic snowman face, I tell you how to make a snowman the smart way. Building a snowman may be "child's play," if you will, but some aspects of sound snowman construction will be less than obvious to those who are new to this art form. It's a dreary winter's day, snow blankets the ground outside, and there's nothing to do. So you decide to build a snowman. Problem is, the decision isn't entirely yours: Mother Nature has a say in whether or not it's a good time for such a project. It's not true that "snow is snow." There are different types of snow, in terms of consistency, just as there are different types of soil. You can't roll sand between thumb and forefinger to form a dirt ball: you need soil of a different consistency. Well, neither can you build a snowman with just any kind of snow. Do a test first. Scoop up a handful of snow. Try to make a snowball out of it. If you can easily make a good, tight snowball, then it may be time to build a snowman. There's a delicate balance: the snow has to be wet enough to be sticky, but it can't be slushy. The other factor is amount of snow. If there's just a dusting, it will be difficult to roll enough snow together to build a snowman. Wait till there's at least a few inches of the white stuff. The classic snowman is composed of three balls stacked vertically. The bottom is the biggest. It forms the foundation, so we'll call it the "legs," even though it looks nothing like legs. The middle ball forms the belly (more properly, "torso"), and that's the next biggest in size. To build a snowman in the classic style, you stick branches into the belly for arms. The third ball is much smaller and forms the head, to which facial features are added. Building a snowman is fun in one sense, but it means some hard work for your muscles. If you have back problems, you might wish to wear a back brace. Push the balls using your legs as much as possible. Another option is to get some help from others and make building a snowman a joint effort. It all starts by making a snowball, which you then put on the ground and start rolling. Sounds simple? But it's not that easy to make a good snowman ball. The idea is to have more snow accumulate on the snowball as you push it around, till it gets big enough to start building a snowman with. But if you push in just one direction, you won't end up with a globe-shaped object: It will look more like a jelly roll! So start rolling it one way, then reverse directions and roll it another way. As you go, pack down the snow with your gloved hands, which will make for a tighter ball. Shave off areas where it's becoming uneven. When this bottom ball gets big, you'd better start pushing it towards its final resting place, before it gets too heavy. Repeat for middle ball, only make it smaller. You'll be glad you did when it comes time to try to hoist it up onto the bottom ball. What if you're done making the middle ball, then realize it is too heavy to lift? This is a very real possibility, especially if you have set out to build a big snowman (one that will show up from far away). If you're building a snowman with someone, roll the ball onto a tarp; then the two of you can get on either side of the tarp and lift. If you're alone, build a plywood ramp. 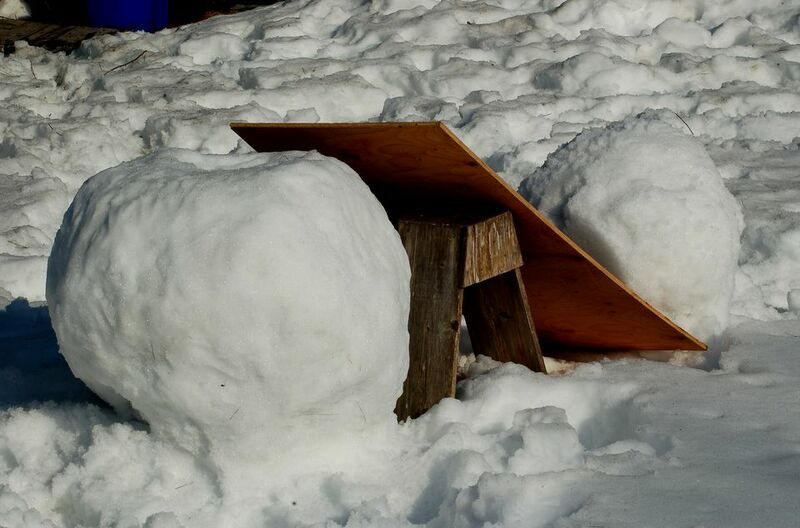 Stick anything you can find under the plywood to support the weight of the giant snowball: a sawhorse (picture), cinder blocks, even packed snow. No matter how you get the ball up, you'll want to provide a seat for it first on the bottom ball. Scoop out snow on top of the bottom ball to make a rounded indentation, in which the next ball can rest. Make the snowball for the head the smallest of the three, but not too small. Why? Because remember, the head has to support the objects you'll be inserting into it for facial features. It also has to support a pipe (see Page 3) and a top hat (see Page 4). I'll discuss a tip later for anchoring facial features, but your snowman's head will need some heft to it for you to implement this tip. Scoop out a seat on top of the middle ball on which the head will be able to rest securely, then mount it up there. A carrot is a classic nose for a snowman. Make a pilot hole for it with a sharp object rather than trying to force the carrot in. In fact, it's good policy to make such pilot holes prior to inserting any objects into your snowman (for eyes, arms, etc). Use as big a carrot as you can find, so that you can shove it in really deep, making it less likely that it will pop out on a warm day. For the eyes and mouth, charcoal (two pieces and three or more pieces, respectively) is the classic material. Small, dark stones are an alternative and have the advantage of not discoloring the snow the way charcoal will do. But whether you use charcoal or stones for the eyes and mouth, these features will pop out on warm days, because they can't be anchored into the head. Alternatively, use big metal washers, sprayed black. Secure them with bolts, pushed into the head at a downward angle. Crooked branches are best for the arms: You can imagine the crook is an elbow. I'm never lacking for branches to use, since I have eastern white pine trees in my yard. Their wood is brittle, so branches often snap off after ice storms. I can simply trim up some of the fallen branches with my ratchet pruners to form arms. I told you before about pilot holes. It's especially important to make them for the arms. This will bring out the sculptor in you. Step back and evaluate the figure. Does it look a bit lopsided somewhere? Did one of the balls come out too flat? "Corrective surgery" is possible. Just add some of the white stuff to areas that could use more, to correct the figure's proportions. Pat it down well to pack it. Likewise, shave off areas that could use a little less. Since the waist and neck are joints, reinforce them by packing extra snow around them. On a warm day, your figure will literally "go to pieces." But you can add more snow and reinsert eyes, etc. that pop out. A Trip to the Snowman Shop? In the movie, Groundhog Day, Bill Murray's character is shown, at one point, finishing up building a snowman by sticking a pipe in its mouth. Upon being queried by Andie MacDowell's character, "Where did you get that? ", Murray quips, "I went over to the snowman shop." In reality, there is, of course, no snowman shop. In the rest of this tutorial, I offer ideas for making your own top hat, making your own pipe, and otherwise dressing your snowman and furnishing him with accessories. Indeed, most of the fun in building a snowman is lies in getting creative with accessories. Anybody can stack up three snowballs and call it a "snowman." But the way you accessorize your figure gives you a chance to put your own unique stamp on it. For example, for the most part, I stick with a classic design when building a snowman. And according to the classic design, your completed figure should be holding a broom (picture). But this is one area where I stray from the classic design. I like to supply my figure with a snow shovel, rather than a broom. I fail to see the connection between a snowman and a broom (What would he be sweeping?). In my region, which is subjected to serious snowstorms, a snow shovel seems much more apt. If I have to shovel snow all winter, then, darn it, Frosty is going to share my burden. Jam the blade of the shovel down into the snow on the ground underneath one of the arms. This will stabilize it at the bottom. At the top, it's probably sufficient just to lean it against the branch, although you can tie it if it doesn't stay put for you. Now it is time to consider ideas for "dressing" your snowman. I put "dressing" in quotes because outfitting a snowman often involves mixing actual clothing with objects meant to suggest clothing. Sometimes, people do not put much thought into the material used for the "buttons" running down a snowman's chest, but here I school you in why black stones are preferable to charcoal -- and why large washers may be even better than stones. Although some people use other types of hats, I like to dress a snowman in the traditional top hat. Of course, few of us have a top hat just lying around (and even if we did, we probably wouldn't want to subject it to the elements). So what's the answer? Improvise. I show you how to make a hat for a snowman of Page 4 of this tutorial. Likewise, unless you have a pipe (for bubble-blowing, for example) hanging around, you'll have to learn how to make a pipe for a snowman. It's the subject of Page 3 of this tutorial, and it's easy. As a creature of the winter, the traditional snowman must be dressed with a scarf. If you don't want to dress your snowman with a scarf of your own (for fear that it will be damaged or stolen), you can make a snowman scarf, by tying colorful rags together. To dress a snowman traditionally, run a string of "buttons" vertically down his torso (the middle of the three balls that comprise a snowman). They don't have to be real buttons: just use small dark objects that represent buttons. In fact, pieces of charcoal or black stones will probably show up better than real buttons, because it's hard to find buttons big enough to be noticed from a distance. Push the the charcoal or stones into the snowman's torso to stabilize them, otherwise they'll fall out too quickly. "Pre-drill" with a sharp object (for example, a stick) to make a pilot hole, so that it will be easier to push the "buttons" in. Some like to dress up a snowman's torso with clothing. A vest (left open) works well for a traditional look. Traditionally, one doesn't dress a snowman below the waste (although I have heard of people positioning a pair of boots at the base of a snowman so as to suggest footwear). Snowman arms usually consist of branches, which are allowed to show (no sense in covering up such a charming feature). Dress a snowman's hands with a pair of old gloves. Try to find a branch with "fingers" at the end, and put a glove over them. You don't actually have to insert the branch fingers into the glove's finger holes; the idea here is simply that the glove is less likely to blow off such a branch or flop around, because the fingers provide resistance. A glove might blow off a straight, unforked branch. Can't find any stones for the buttons? Raid your water garden for some river rock. I find that stones make better buttons than charcoal, because the latter stains your snow black. Whether charcoal or stones, buttons will pop out on warm days. Alternatively, use big metal washers. Secure them with bolts, pushed into the snowman at a downward angle (spray both black). If you decide to dress a snowman in a vest, apply the vest before you insert his stick arms. Once the arms are on, you can fasten the vest to the arms so that it won't blow away. If the vest is old (and you don't care if it becomes damaged), make holes in the fabric, insert copper wiring through those holes, and wrap the wiring around the snowman's branch arms. If you do not smoke a pipe (or blow bubbles out of a pipe), you may wonder how you are going to furnish your figure with a pipe -- truly a classic look that's not to be missed! -- without buying one especially for the occasion. I'm all about cheap landscaping, so I don't want you to spend any money on this project if you don't have to. That's why I show you how to make your own snowman pipe in this article. As is so often the case in craft projects, I found it helpful to have at my disposal a glue gun (which also came in handy for making a snowman hat (see below) and a Dremel tool. But you can certainly improvise without these tools. You could substitute a drill for the Dremel tool. To remove the label from the pill bottle, soak the bottle in water before starting. This will loosen the label up and enable you to scrape it off easily. The pill bottle is the "bowl" of the snowman pipe; you must join it securely to a "stem." I used a straw as the stem for my snowman pipe, but a butter knife is better (see below). If you use a butter knife, insert the handle end into the bottle. With the Dremel tool, drill a hole through both sides of the bottle (toward the bottom of the bottle) to accommodate the stem. I marked holes with a magic marker prior to drilling, to serve as a guide. Inserting the stem through both sides will provide a firmer, more secure fit. After you've inserted the stem of your snowman pipe, it's time to fire up the glue gun. Once it's warm, direct some hot glue down the inner sides of the bottle, further securing the stem. This comes down to personal preference, but I like the pipe for a snowman to be colored black. So I spray-painted mine. When using spray paint, always make sure you have proper ventilation. Your snowman pipe is ready to be "smoked." The taller the bowl, the greater its tendency to flip down. So keep the height of the bowl to a minimum. If you decide later that you've made it too tall, reduce its height. Dremel tools have attachments for such cutting jobs. If you substituted a drill for the Dremel tool, do your cutting with a hacksaw, instead. If you use a flat object for your stem, such as a butter knife, it won't rotate as easily as a rounded object (for example, a pencil or straw) will. Result: the pipe will hold its position better in the snowman's mouth. The snowman is a creature of the North, of cold weather and ice storms, infused with the spirit of Old Man Winter's huffing and puffing. As such, I think it is a good idea to dress him in a hat. What, you do not have a hat lying around to use on your snowman? Make your own! This project will give you a chance to recycle some materials. While woolen hats can be used in snowman apparel, I prefer the traditional black top hat. An example is shown in my picture here, which features the final version of the snowman presented in this tutorial. Find an empty flower pot lying around your storage shed. I found a plastic pot that had just about the right dimensions for my project: 12 inches across at the rim, 8 inches across at the bottom, and of sufficient height. Because of the way it flares out at the rim -- creating something like the look of a brim -- it makes a more convincing top hat than most flower pots would. The flower pot was originally green. All I had to do to make it a top hat for a snowman was to spray-paint it black (if you can find the right pot and it just happens to be black, you don't need to do any work at all). Flower pots can be recycled for other purposes, as well. Elsewhere I relate how to recycle plastic pots to make plant markers. 2. Going to the Movies? Bring Home the Popcorn Tub! Go to a movie and buy a popcorn tub. Sounds like a strange instruction in a piece on how to make a hat for a snowman, right? But you'll bring home the tub and use it for the snowman hat's crown. Alternatively, scrounge around for a similar container. Now find something for the brim of the hat, which you'll attach to the tub. Go rummage around in the garage in search of an old plastic lid or other flat, round item. Once you've found that item, put the tub in the middle of it and trace a line around it. That marks the inner edge for your brim. For the outer edge, trace a second line using a dish whose diameter is a few inches greater than the tub's. Cut out the shape you just outlined and glue it to the tub. Spray-paint the hat black. 3. Don't Kick the Can Down the Road -- Use It! You can use the same technique to make a snowman hat (as you just read about above) using different materials. This third idea I mention will yield a smaller top hat and thus would be appropriate for a smaller snowman. For the crown, use a small-sized coffee can; for the brim, an old Frisbee. Place the can in the middle of the Frisbee and trace a line, just as was suggested above. Using this mark as a guide, cut the middle out of the Frisbee. Now cut the curved edge off the Frisbee, so that you essentially end up with a flat, wheel-shaped figure. Again, a Dremel tool is very handy for making such cuts, but you can improvise using a hacksaw, Exacto knife, etc. Glue-gun the brim to the crown, and spray-paint the top hat black. A top hat has been known to blow off the head of a person who wears one on a windy day, so you have to anticipate that a top hat might blow off the frosty head of your stylish snowman, too. One thing you can do to secure a top hat to a snowman is to drill holes in the lower part of the hat, then gently push spikes (or stakes, dowels, twigs, etc.) through these holes down into the snowman's head, thereby anchoring the top hat. Can't do that on a person. Chalk one up to the snowman! What's next? Check out my other recycling ideas here, including what to do with Christmas trees after you take them down. Or if you're interested in another fun winter project, try building an igloo with the kids. If you're not the outdoorsy type in winter, stay indoors and plan your spring landscaping by reading my plant selection tips or browsing my Plants Database.